Will it be a shootout, or will the baymen make it a scrappy encounter ? 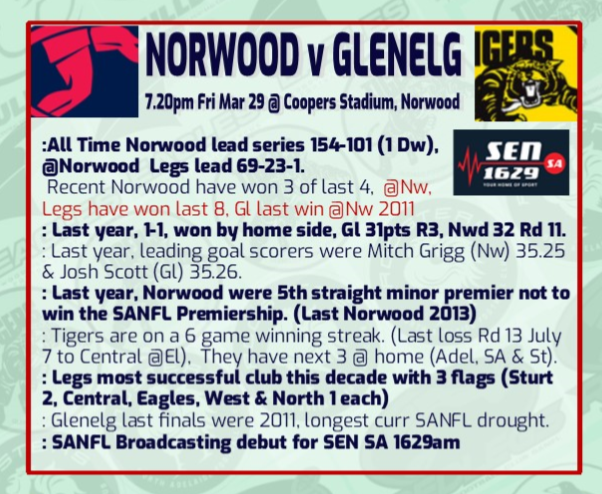 Norwood will add plenty of pace to its line-up to confront Glenelg at The Parade. Former Bays wingman Dom Barry (25, 179cm and 78kg) will face his old side from a half-forward flank after being delisted by Port Adelaide in the off-season. Ex-Panthers forward Cody Szust (22, 183cm and 75kg) will also don the red and blue for the first time after being named on the extended interchange bench. Key defender Michael Talia will continue his progression from a back injury by starting in the Reserves. Di Stefano, Pascoe, Carroll, Crauford, Coles, Wilhelm, Saywell, Millman, D. Johnston, Talia, L. Charlton, Stephens, Taheny, J. Richards, Heard, Olsson, J. Wilson, Hay, Grove, Martin, Spence, Ball. Glenelg is set to unveil star recruits Luke Partington and Cory Gregson against Norwood at The Parade. Partington, from West Coast, and Gregson, from Geelong, have been named in the 23-man squad to face the Redlegs. Key forward Liam McBean and and defender Brad Agnew will return after a year overseas while former North Adelaide linkman Michael Virgin is on the extended bench. RAA Rookies Finn Betterman (18, 182cm and 75kg) and Will Gould (18, 191cm and 97kg) will also get their chance to shine for the first time in the Statewide Super League. Fearless midfielder Matt Snook will start in the Reserves after being hampered by a groin complaint this pre-season. Bailey, Baldwin, H. Boyle, Carmody, Carney, Davis, Emmett, Feely, Gamble, Holyoak, Kelly-Mansell, Kerrish, Koster, Leck, LeCornu, Martini, McDermott, Milera, Snook, Symonds. Aaaand we are off and racing. Bays to continue their winning streak with a 5 point win at the Parade. Disappointing not to hold on. Had a late chance to take the choccies but couldn't convert. Bays need to win the close ones if we are going to play finals.